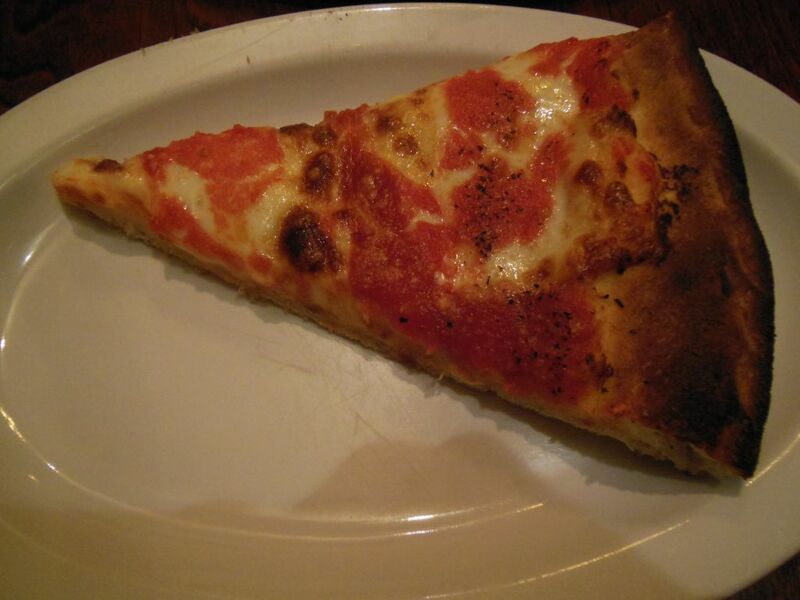 The Slice website offers a map of the twenty current New York City-Area Coal-Oven Pizzerias. The intense dry heat of a coal oven can produce a charred and crisp pizza crust that is delightfully delicious. I have heard it said that new locations are currently banned for environmental sake, and that a prospective pizza-maker can only inherit an existing one. However, another Slice article states that there is no such ban on the books, and the scarcity of coal ovens is due to the fact that they are merely a hassle to maintain. As you would expect, the Snob has his sights set on visiting all twenty. 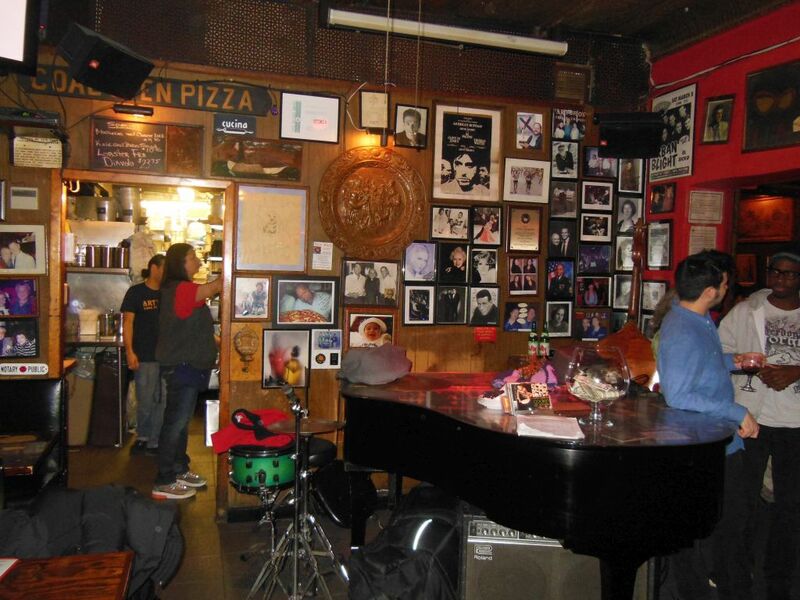 The last time I was in Manhattan, my limited powers of observation finally noticed Arturo’s Coal Oven Pizza. This was despite the fact that I have probably driven by its location on the corner of West Houston and Thompson a million times. For the unfamiliar, Houston (pronounced “house – ton”) is a busy boulevard that serves as the dividing line between Greenwich Village and Soho. My desire to visit Arturo’s was recently heightened when a 1960’s photo of Bob Dylan walking past the place appeared on the cover of the booklet to his Another Self Portrait box set. Early one Sunday evening, I made the journey into the quiet lower Manhattan to visit my fifth of the twenty coal ovens. Arturo’s has been around since 1957. Walking inside is like entering a timeless movie set of Manhattan in the last fifty years. The elegant red façade leads you into the front room where a live jazz trio plays amidst the busy classic wooden bar. Off to the right are two separate dining rooms. All three rooms are tight quarters fully adorned with old photos and bright colorful caricature-like artwork by Arturo himself. 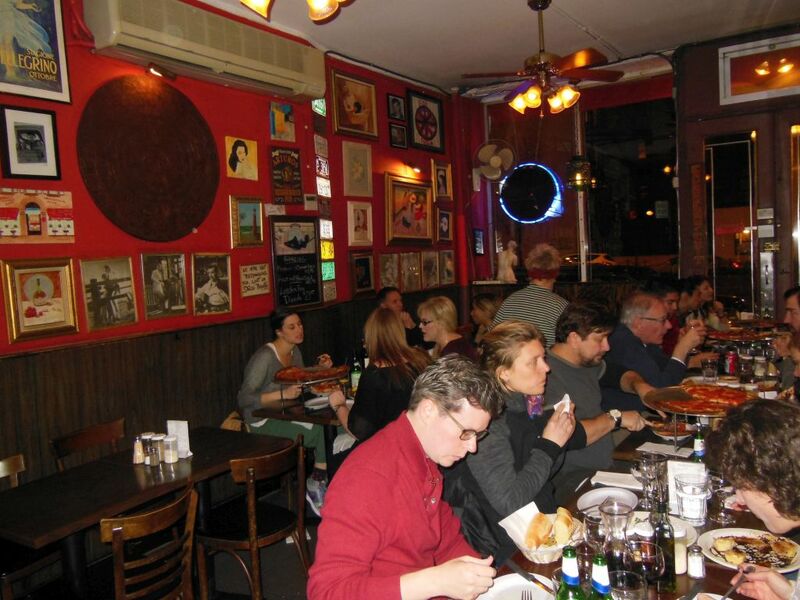 Although Arturo’s offers a fairly full Italian menu, just about everyone I saw was there for pizza. 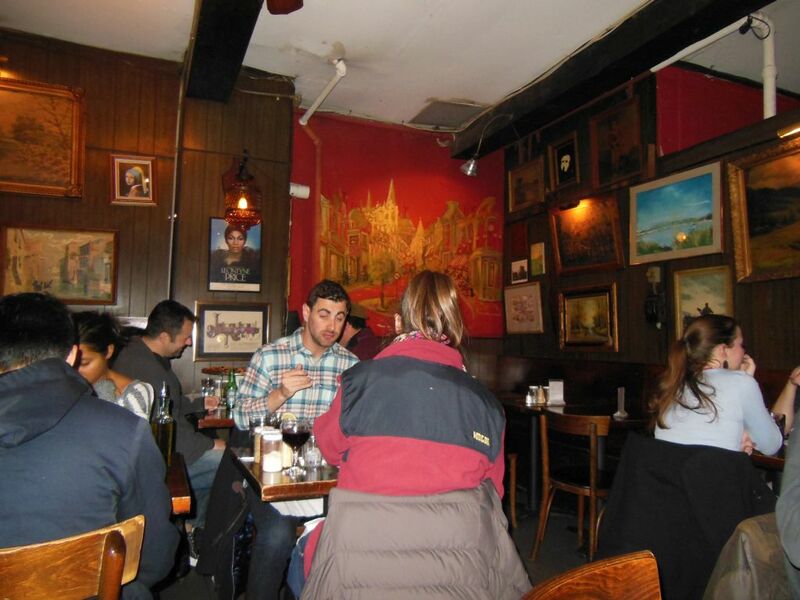 Seated in the back room, I ordered a small Mozzarella ($17) after which I walked the rooms admiring the owner’s interesting artwork. My pie arrived with the coal oven charred look, but was surprisingly much thicker than I would have expected. Still feeling full from a late birthday lunch for Mom, my first thoughts upon seeing this pie was that it was way too heavy for my current appetite. Nonetheless, I didn’t hold back, and only half of the eight slices remained in the to-go box for Mom and Dad. Arturo’s pie was about as red looking as I have ever seen with an extra dose of tomato sauce applied atop the scattered streaks of cheese below. The end crust was deeply charred black and crisp, almost to the point where you’d label them as burnt. Given this oven treatment, the slices stood up strong and firm supporting much more cheese and dough than I like to handle. This sucker was at least a half an inch thick! It’s a pie constructed more along the lines of what you’d get at a Mellow Mushroom and not a Manhattan pizza joint. Despite this major shortcoming, it still was a tasty dish attributable to the fine ingredients and the magic heat of the coal oven. In comparing Arturo’s pizza to the other coal oven pies I have had in the past, I was surprised that it did not have as much coal flavor as the others nor was its crust as chewy. 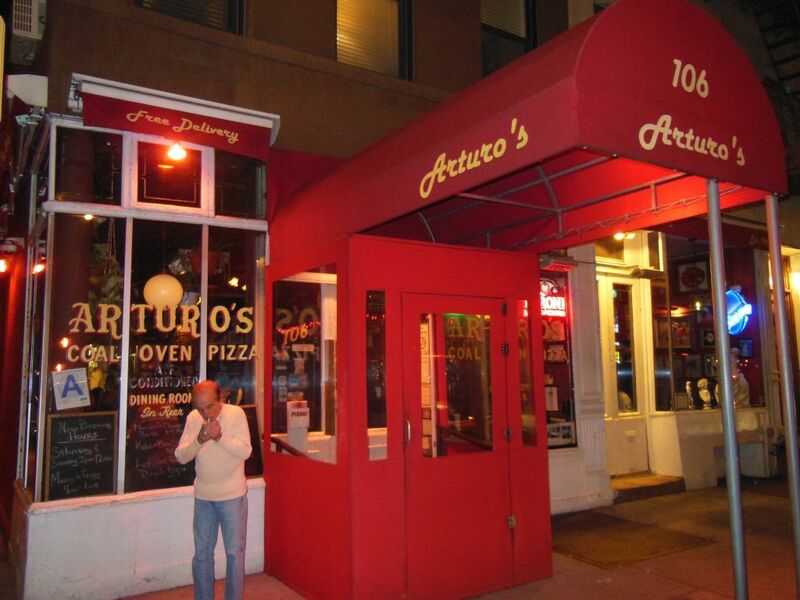 Arturo’s was a fun place to visit, but there’s much better and less heavy pizza to choose from in the city. The thing about Arturo’s is you should always get a large – it comes out much thinner, because I think they use the same dough ball to make each size pie. Also, depending on how busy they are, it’s fairly inconsistent. Used to be a top 5 for me, now Keste, Motorino, Lucali’s, Giuseppina’s, Totonno’s, Patsy’s and a few others all moved ahead.